Slime is a unique play material composed of a cross-linked polymer. It is classified as a liquid and is typically made by combining polyvinyl alcohol solutions with borate ions in a large mixing container. It often has an unpleasant odor, a green color, and is cold and slimy to the touch. In scientific terms, slime is classified as a non-Newtonian fluid. These are thick liquids that have a variable viscosity. Viscosity is a measurement of the resistance to flow when a shearing force is applied. Newtonian fluids have a constant viscosity depending on their composition. For example, water is always a thin liquid with a low viscosity. Molasses is thick and has a high viscosity. Non-Newtonian fluids, like slime, have a different viscosity based on the amount of force put on them. If a small amount of force is applied, such as stirring them slowly with your fingers, they feel thin and water-like. If a high force is applied, like throwing it against a wall, the resistance is very strong. They are called non-Newtonian fluids because they do not behave as predicted by Newton's laws. Other materials that also behave like this include ketchup, gelatin, glue, and quicksand. The molecular structure of slime is the factor responsible for its interesting behavior. Toy slime is typically composed of tangled, long-chain polymer molecules. These polymer molecules can be thought of as spaghetti strands. When put together on a plate, the strands are mixed together making a tangled mess. If the strands are rubbed together, they line up and become smoother. This motion gives the mass its slimy, slippery feel. While the intermixing of the polymer strands will give some built-in viscosity, a cross-linking agent is also present in slime to give it the non-Newtonian fluid behavior. Cross-linking agents are ions that help temporarily connect polymer strands with relatively weak ionic bonds. These bonds are strong enough to hold the polymer strands together but not strong enough to make the mass a solid. The story of toy slime's development dates back to the beginning of the twentieth century when the science of synthetic polymers was being determined. During the 1920s, Nobel laureate Hermann Staudinger laid the groundwork for our modern understanding of polymer science. He suggested a new molecular model for polymers; one of long, chain-like molecules and not aggregates or cyclic compounds as previously thought. In 1928, his models were confirmed by Meyer and Mark. These two scientists studied the dimensions of natural rubber using x-ray techniques. By the 1930s, Staudinger's models were widely accepted and extensive development of synthetic polymers began in earnest. Manufacturers have sold polymeric play materials like slime for years. They are known to not only amuse children and adults, but also help in the development of dexterity and creativity. The earliest of these toys were moldable materials like modeling clay. The need for improved and varied play materials led to the development of silly putty in the 1950s. Glow-in-the-dark silly putty was subsequently introduced. During the 1980s, various slime-type toys were introduced. These products were made from such materials as polyvinyl alcohol, guar gums, or even fortified milk. Although a wide variety of slime variants are sold, they have many common characteristics. In general, slime is a gooey liquid available in small tubs. It can be sold by itself or as part of a toy set, such as an accessory for an action figure. Slime has a slightly unpleasant odor and is cold and slimy to the touch. Colors vary but the most common are green, blue, and red. Some manufacturers add fragrances to improve the odor. One of the key aspects of slime formulation is that the materials must be safe for young children. In general, this means that the raw materials used to make slime must be nonirritating to the skin or eyes and non-toxic in case of ingestion. Additionally, consumers demand that slime (and toys like it) will not damage things like clothing, upholstery, fabric, or carpeting. Slime formulas are initially produced in laboratories by chemists. These scientists begin by determining what aesthetic features the slime will have. For example, they decide what the consistency will be, what color it will have and what it will smell like. Consumer testing is often used to help in making these decisions. After the features are determined, small test batches are made in the laboratory using the primary raw materials. The most common ingredients used in the production of toy slime are water, polymeric materials, gelling agents, colorants, fillers, and preservatives. The most abundant material in slime is water, typically making up over 90% of the formula. Generally, specially treated deionized water is used. Water is a diluent that gives the slime its liquid consistency. The source of the water can be from underground wells, lakes, and rivers. The polymeric materials are responsible for the important characteristics of slime. The most commonly used material is polyvinyl alcohol (PVA). PVA is a long chain polymer that has a backbone of carbon molecules with numerous hydroxyl (OH) groups attached. In a typical slime formula, about 2% PVA is needed. Another similar polymer is polyvinylacetate (PVAC). This has a slightly different chemical makeup but it behaves in the same way as PVA when a gelling agent is added. Certain "natural" polymers can also be used to produce slime. Common examples include guar gum, which is derived from the bean of the guar plant, methylcellulose, which comes from plants, and cornstarch. While the polymeric materials give slime its substance, a gelling agent is needed to give it the non-Newtonian liquid behavior. In classic slime formulations, sodium borate (Borax) or sodium tetraborate is used. When dissolved in water, sodium borate dissociates into sodium ions and borate ions. If a polymer is present like PVA, the borate ions interact with the polymer chains and form weak ionic bonds that make the solution thicker. These bonds also give the ability to stretch when a force is applied. Typically, sodium borate makes up about 2% of the final product. The ratio of the polymer to the gelling agent is one factor in determining the consistency of the slime. A variety of additional ingredients are added to slime products to improve color and odor. In general, the polymeric solutions used in slime manufacturing are colorless. Therefore, a variety of dyes are added to give the product color. These are typically government-certified food colorings, such as FD&C Blue and FD&C Yellow. To improve the odor of slime, a fragrance is often added. Fragrances are made up of volatile oil materials. Since contamination from mold and bacteria is possible, preservatives like formaldehyde or methylparaben are also added to prevent microbial growth. Additionally, various acids or bases may be included to control the pH of the slime. The production of slime occurs in two steps. First, a batch of slime is made. Then it is filled into its final packaging. This process can vary however, as filling may be easier if the cross-linking agent is not added until the polymeric solution is in the final package. The following description outlines a batch process. Slime is made by combining a 5:1 mixture of polyvinyl alcohol (PVA) solution and a Borax solution. 1 The batches of slime are made in large, stainless steel tanks fitted with mixers and a temperature control system. Starting with water, compounders add the rest of the raw materials according to the formula instructions at specific times and temperatures. Using computer controls, the mixing speed and temperature are regulated. 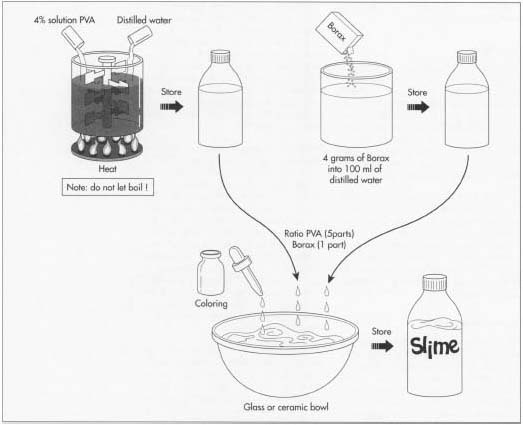 Slime is typically heated to get the PVA to mix into the solution. Colorants, preservatives, and other additives are added last. 2 After the compounding phase, a batch sample is taken to the quality control lab for approval. In this area, physical and chemical evaluations are performed to ensure that the batch meets the minimum specifications outlined in the formula instructions. Tests, such as pH determination, viscosity checks, and appearance and odor evaluations, may be conducted. Adjustments can be made at this point if needed. After the batch is approved, it is pumped to a holding tank, where it is stored prior to filling. 3 The filling stage depends on the type of packaging in which the slime will be sold. For the typical tub of slime, the process occurs on a filling line. At one end of the filling line is a hopper containing the empty tubs. These tubs are physically manipulated by a rotating machine until they are standing upright. They are then moved along a conveyor belt to the filling heads, which contain the slime solution. 4 The filling heads are a series of piston tubes connected together on a circular carousel. As the tubs pass under the filling heads, product is injected into them. 5 Once filled, the tubs are moved along to a capping machine. This machine sorts the lids, places them on the tubs, and tightens them down. 6 If necessary, the tubs pass through a labeling machine. Sometimes this is not required because pre-decorated packaging is used. Further packaging steps might occur at this point, such as shrink wrapping or adding a cardboard backing. The packages are then put into boxes and stacked onto pallets. The pallets are hauled to storage and eventually shipped to local retail outlets. Quality control is a continuous process occurring during the entire production process. Prior to batching, the raw materials are inspected and tested to ensure they meet minimum specifications. This inspection process typically involves work by quality control chemists, who check various physical and chemical characteristics. They measure characteristics of the incoming raw materials such as particle size, pH, viscosity, appearance, and odor. If a raw material does not meet the predetermined specifications, it is rejected. Batches are similarly tested. If a batch does not meet all of the specifications, an adjustment may be made. For example, if the color of the batch is off more dye can be added. Preservation tests help ensure that the toys will be safe from microbial growth upon long-term usage. Stability tests also are performed. These studies monitor the performance of a finished batch under a variety of environmental conditions. On the filling lines, line inspectors inspect the bottles appearance, cap sealing, and filling weights. Toys like slime have an intrinsic quality that makes them both fascinating and fun. While current materials enjoy commercial success, there remains a need for improved and varied play material formulations. Already some variations on the classic slime product are available. For example, slime kits are sold that allow the user to create their own slime products. In the future, toy manufacturers will focus on finding new ways to sell current slime and also create new, novel materials. Kirk-Othmer. Encyclopedia of Chemical Technology. New York: Wiley Interscience, 1997. Shibayama, M. "Poly(Vinyl Alcohol)-Ion Complex Gels." In Polymeric Materials Encyclopedia.. Edited by J. Salamone. New York: CRC Press, 1996. Casassa, E. Z., A. M. Sarquis, and C. H. Dyke "The Gelation of Polyvinyl Alcohol with Borax." Journal of Chemical Education 63 (1986). Sarquid, A.M. "Dramatization of Polymeric Bonding Using Slime." Journal of Chemical Education 63 (1986). manufacturing process of polyvinyl alcohol should also be added in this article.